Strain rate dependency of glass strength is well known in structural glass design (Mould and Southwick, 1959; Marsh, 1964; Brown, 1972; Menčík, 1992, p.83; Lawn, 1993, p.277) and implemented in standards like DIN 18008-1 (2010), DIN 18008-4 (2013), E DIN EN 16612 (2013) and ASTM E1300-16 (2016). 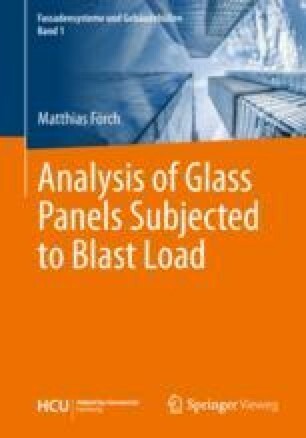 Glass strength tests under soft impact load are presented for different glass build-ups in Schneider (2001, p.183) and monolithic glass in Kuntsche (2015, p.236). König (2012) focusses on experimental tension tests of annealed glass specimens under different strain rates with surface condition as delivered.